Talks aimed at ending the grievances of Macedonia's ethnic Albanians have ended in the capital, Skopje, as a 48-hour lull in fighting with rebels was ended by new gunfire. President Boris Trajkovsi, who chaired the three-and-a-half hours of talks, said afterwards that more discussions would follow on proposals which he had put forward. He has the delicate task of satisfying the Albanians' demands for more rights without provoking a backlash from the Slav majority - and with pressure from the outside world to turn the country back from war. The renewed gunfire came in the village of Selce, above the flashpoint city of Tetovo. Security forces exchanged fire with a group of gunmen trying to enter the village, Defence Ministry spokesman Georgi Trendafilov told Reuters news agency. Monday's talks were attended by the largest ethnic Albanian party, the Democratic Party of Albanians, which is in the governing coalition. But they were boycotted by the main ethnic Albanian opposition party, the Party for Democratic Prosperity. President Trajkovski described the boycott as regrettable, but the party defended the move. "The PDP thinks that this unofficial meeting is intended to daze the international community into believing that some talks are taking place in Macedonia and that dialogue continues," PDP spokesman Zahir Bekteshi told Reuters news agency. After the talks, President Trajkovski said a dialogue would continue "that would allow all sectors, all inhabitants of this country to benefit." "We want to create a society of individuals, not ethnic groups," he said. The leader of the DPA, Arben Xhaferi, has threatened to pull out of government unless its demands are met within a month. He has also warned that the rebels will return if progress is not made. "They have not gone. They are here, in civilian clothes. They will see the outcome of our negotiations and if they are not happy they will continue again," he told the French news agency AFP. On Monday morning, the army had reported a completely quiet night, and the authorities said the revolt was at an end. However, their claim a week ago to have successfully driven rebels from the hills around Tetovo proved premature. 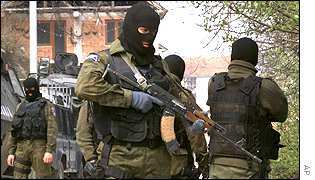 It is not clear whether the rebels are dead, have fled into Kosovo, or have blended back into the civilian population. But correspondents say the brief rebellion has changed the political situation in Macedonia - with the government accepting that the grievances of the Albanian minority have to be addressed, and the hand of Albanian politicians strengthened. Both the European Union and Nato are also adding pressure for a settlement, fearing another outbreak of war in the Balkans which could destabilise the whole region. The EU's foreign affairs commissioner, Chris Patten, and security chief, Javier Solana, travelled to Skopje on Monday for more talks with the president. "We don't want to be mediators but Mr Solana hopes to find a way of reinvigorating the process and solidifying the national consensus at this time of trouble," said Mr Solana's spokeswoman, Cristina Gallach. A crowd of around 80 anti-western demonstrators was waiting for them at Mr Trajkovski's office, shouting "fascists" and protesting against the idea of compromising with the ethnic Albanians. Origins and History Bosnia-Hercegovina Under the Austro-Hungarian Empire, 1878-1918: Prelude to World War I. The Serbian Orthodox populations of Bosnia-Hercegovina revolted in 1875 against Ottoman Turkish Muslim rule with the expectation of independence and an opportunity to decide their own national and political future. Instead, at the Congress of Berlin in 1878, sponsored by Germany and Britain and Austria, under Article XXV of the Treaty of Berlin, Bosnia-Hercegovina was placed under the administration and occupation of the Austro-Hungarian Empire. The Austro-Hungarian occupation and later illegal annexation of Bosnia-Hercegovina would precipitate and set in motion the events that would lead to World War I, the Great War. The Austro-Hungarian occupation and annexation of Bosnia-Hercegovina was the prelude to World War I. The 1875 Bosnian Revolution by the Serbian population against Turkish misrule in Bosnia was caused by increased economic exploitation of the Serbian Orthodox population which faced famine conditions and by a lack of a political future due to political repression. They were also motivated by the advantages Serbia gained in 1867 and by the Cretan insurrection of 1866-9. The 1804 Serbian Revolution had ushered in a nationalist revival among the Serbian population. This nationalism was thwarted in Bosnia. When it exploded in 1875, it threatened to plunge the Great Powers into war. Serbia and Montenegro had declared war against Turkey on behalf of the Serbian Orthodox of Bosnia. The Berlin Memorandum of May, 1875 and the Constantinople Conference of December 1876 were attempts to resolve the Eastern Question and to end the bloodshed in the Balkans. In April, 1877, Russia declared war on Turkey following an agreement that would allow Austria to occupy Bosnia and Hercegovina and an agreement with Romania to use its territory as a staging area to launch an assault against the Turks. The Russians defeated the Turkish forces and had advanced to the outskirts of Constantinople. The Peace of San Stefano resulted which saw the emergence of Bulgaria. The British Prime Minister Benjamin Disraeli sought to prevent the Russians from gaining access to the straits through a spirited foreign policy. Disraeli sent a British fleet to the Sea of Marmora. A war between Russia and Britain was imminent. Austria-Hungary sought to curb Slavic expansion and independence in the Balkans. Count Julius Andrassy, the Foreign Minister of the Habsburg Monarchy, proposed a congress to resolve the issues, to be attended by Otto von Bismarck, Julius Andrassy, Benjamin Disraeli, Peter Shouvalov, the Russian ambassador in London, Alexander Gorchakov, the Russian Chancellor, and Lord Salisbury. This was how matters stood when the Congress of Berlin was convened from June 13 to July 13, 1878. Before the Congress met, secret protocols were agreed to between Russia and Britain: 1) Bulgaria would be partitioned into a northern territory and a southern territory, eastern Rumelia; 2) Turkey would cede Cyprus to Britain; and, 3) Austria-Hungary would occupy and administer Bosnia-Hercegovina. Turkey retained sovereignty over Bosnia. Austria-Hungary also occupied Novi Pazar, a strategic region that separated Serbia and Montenegro and was an important route to Salonika. Austria wanted to keep Montenegro and Serbia from uniting, which was an obstacle to the German-Austrian Drang nach Osten policy, "drive on the East". Priboj, Prijepolje, and Plevlje were garrisoned by the Austro-Hungarian Army. Before the Congress, Bismarck had stated that Germany would act as an honest broker between the parties and not as an arbitrator of the claims. When the Congress ended, Bismarck declared that it had within the limits of what was possible, done Europe the service of keeping and maintaining the peace. Benjamin Disraeli stated that he had brought peace with honour. Did peace result? Erich Eyck assessed the Congress as follows: It is fair to say that the Congress treated the Balkan peoples like mere pawns on a chessboard. Bismarck contemptuously dismissed the aspirations and interests of the Serbian population as noted by a French diplomat who worked on the secretariat of the Congress: The Congress assigned or refused territory to the Serbs or the Turks without any regard to the wishes or objections of either side, which were treated with lofty indifference. Bismarck failed to perceive that Slavic nationalism would assert itself, just as Italian and German nationalism were the key political developments of the 19th century in Europe. Italian and German national consciousness and unification of all German and Italian lands into unified states, a Greater Germany and a Greater Italy, would become a stimulus and model for Slavic and Pan-Slavic nationalism and would guide Bosnian nationalism. The Young Bosnia Movement and Serbian nationalism were guided by the Young Italy Movement and the example of Piedmont in national unification and nationalism. Instead, Bismarck was guided by Realpolitik, practical or power politics. He saw the Balkan Crises and the whole Eastern Question as a divisive issue to keep Europe divided and distracted so that German interests could be thereby advanced. In November, 1878, Bismarck explained this policy as follows: It would be a triumph for our statesmanship if we succeeded in keeping the Eastern ulcer open and thus jarred the harmony of the other Great Powers in order to secure our own peace. British Prime Minister William Gladstone perceived the Balkan Crises as peoples rightly struggling to be free and favored a policy that would create a united European and Christian front against the Ottoman Empire and its misrule and occupation of the Balkans. Benjamin Disraeli, however, rejected this policy and sought to support Ottoman Turkey as a bulwark against Russia and Orthodoxy to safeguard the British naval supremacy and deny Russia access to the straits. There was a diplomatic initiative that sought to characterize the Balkans conflict as a human not a political crisis, that it should be seen from the perspective of humanity and not as a political or Realpolitik issue. This was the precursor of what would become known as humanitarian interventionism or military humanism of the US State Department in the 1990s. Both Otto von Bismarck and Benjamin Disraeli rejected any solution that was not based on national interest or Realpolitik, power politics. Alexander Gorchakov, the Russian Chancellor, argued that the Balkans crises were a European problem that should be resolved by a common policy: The problem is neither German nor Russian, but European. British and German policy, however, focused on their respective national interests and a balance of power theory and did not consider it a priority to help victims of Turkish misrule. In a speech before the Reichstag on December 5, 1876, Bismarck stated that there was no German interest worth the bones of a Pomeranian musketeer. The German Ambassador to Russia, General Lothar von Schweinitz, disagreed with the Realpolitik policy of Bismarck. Schweinitz, a Prussian conservative, believed that there was a need for guiding principles in politics and rejected a policy based solely on power politics, self-interest, and political expediency. He wrote that the German government did not perceive the Balkan crises from the point of view of humanity but wants to turn them to political advantage and bring about a constellation of the great powers, by which coalitions hostile to us shall be made impossible for a long time to come. The Eastern ulcer that Bismarck sought to keep open would burst in 1914 and engulf the world in war, World War I, the Great War. The seeds to the First World War were sown at the Congress of Berlin in 1878. By not resolving the national interests of the Balkan peoples in a just and fair manner, a time bomb was created which would eventually explode into World War I. The Hapsburg Monarchy maintained an anti-Orthodox, anti-Serbian, and anti-Pan Slavic policy. Pope Leo XIII convinced Austrian Emperor Franz Joseph to create a league of Catholic states which would act as a bulwark of Catholicism against Orthodoxy and Pan-Slavism. Thus, both the Vatican and the Austro-Hungarian Monarchy waged an undeclared war against Serbian Orthodox Christians. They both worked to Catholicize Bosnia and to extend Roman Catholic influence in the province. Roman Catholic cathedrals and churches were constructed with the sponsorship and support of the Austrian regime. In 1914, Pope Pius X sanctioned the Austrian declaration of war against Serbia, ushering in the Great War, World War I.
Austria-Hungary underpinned its occupation of Bosnia on an ideological position that attacked the nationalist policy of a Greater Servia or Greater Serbia. This is the origin of the propaganda and ideological anti-Serbian policy that regarded any Serbian Orthodox attempt to assert self-rule, autonomy, or national self-determination as a policy of Greater Servia. This propaganda policy would be adopted by the US State Department and CIA and Pentagon during the 1990s break-up and civil wars in Yugoslavia. But this Greater Serbia propaganda policy was developed and applied by the Austro-Hunagrian regime earlier, and not by James Rubin, Madeleine Albright, Peter Galbraith, Anthony Lewis, or the CIA and Pentagon, which were just aping and plagiarizing this earlier policy developed and originated by Austria-Hungary. One method by which the Austrian regime exploited this Greater Serbia propaganda policy was in a series of famous show trials that sought to implicate Serbia in the political unrest in Bosnia. The most famous was the 1909 Agram or Zagreb show trial, which accused 53 persons, traders and teachers, of high treason, as being agents of Greater Serbia, agents of the Serbian government. The show trial lasted from March 3 to October 5, 1909. Thirty-one defendants were found guilty. On appeal, the sentences were quashed in November, 1910. There was no evidence to support the charges. The trial was merely a trumped up political show trial. A second show trial was the Friedjung trial, a libel action against Dr. Henry Friedjung, who had accused three prominent figures in Neue Freie Presse on March 25,1909 that they were agents of Greater Serbia. The case was dropped after it was found that the documents in the case had been forged. The administration of Bosnia-Hercegovina was placed under the Austro-Hungarian Joint Ministry of Finance and were included within the Austro-Hungarian Customs Union following the the Austrian-Turkish Convention of April, 1879. The Austro-Hungarian anti-Serbian and anti-Orthodox policy was carried out by Benjamin von Kallay, the Finance Minister from 1882 until his death in 1903. Kallay was an expert on Balkan affairs. He had written a book, History of the Serbs, in which he had "admitted the racial identity of Serbs and Bosnians", that is, in which he had shown that the Bosnian Serbs and many of the Slavic Bosnian Muslims were ethnically the same. When he became the administrator of Bosnia, however, he prohibited and banned the distribution of his own book because "it might help pro-Serb tendencies". According to historian H.C. Darby, Baron Kallay "proceeded to create an ordered administration on somewhat despotic lines." Kallay advocated the Bosnian nationality ( Boshnjaci, Boshnjachka, Bosniak) as a divisive tool to prevent Pan-Slavic unity and to prevent a separate ethnic or national identity for the Serbian and Croatian populations. For the same reasons, the Bosnian Muslims were strongly supported by the Austrian regime to maintain the status quo established by Ottoman rule to prevent any Slavic unity, which the Austrian government feared the most. Austrian policy was to keep the minority Bosnian Muslims in control and in power in Bosnia and to maintain Bosnia as it had existed under Turkish rule to prevent the Orthodox Serbian population from seeking to determine its own national destiny. Istvan, Baron von Burian, who succeeded Kallay in 1903, granted some religious autonomy to the Serbian and Muslim populace during his administration which lasted until 1912. In 1910, Burian established a parliament in Bosnia, but with limited powers. Burian thus initiated makeshift measures that sought to quell the nationalist movements, which were guided by Slavic and Pan-Slavic nationalism and unity. The 19th century was a century that saw the emergence of nationalism and a concomitant goal to establish national unity. France was the first to espouse nationalism and to achieve national unification. Italy and Germany followed. The Slavic peoples of Eastern Europe and the Balkans were similarly guided by nationalism and the objective of national unification. Bosnia-Hercegovina was where nationalism and national unification would develop as well. The Austrians lost no time in shoring up the power of the Bosnian Muslims. The Austrian government expended considerable funds in restoring and renovating Muslim mosques and Muslim religious schools and institutions. Large amounts of Austrian funds were used to preserve Islamic education and Islamic institutions and training in Bosnia, which were perceived as threatened with the expulsion of the Ottoman Turks. These Moslems were the traditional enemies of the Christian Serbs, and in 1941 their religious zeal had urged them to join in the massacres of Serbs As pillage was followed by discipline, the energy of the Mujos was canalized into the Waffen SS. The Mujos were organized on the lines of the Bosnian regiments of the old imperial Austrian army, with officers and even N.C.O.s of German race, but they wore the Turkish fez with their runes and each battalion had an Imam. Four infantry regiments were recruited from the Bosnian Muslim population by the Austrian regime following the 1878 occupation: the Bosnia-Hercegovina Regiment No. 1, recruited around Sarajevo; the Regiment No. 2, recruited around Banja Luka; the Regiment No. 3, recruited around Tuzla; and, the Regiment No. 4, recruited around Mostar. Following the outbreak of World War I in 1914, these Bosnian Muslim regiments in the Austro-Hungarian Imperial Army would be thrust against the Serbian Army. These troops would commit massacres and atrocities against the Serbian Orthodox population. The Serbian Orthodox population of Bosnia-Hercegovina remained the largest ethnic group. In the 1910 Austro-Hungarian Census, the Orthodox Serbian population of Bosnia-Hercegovina was 43.5 %, or 825, 418; Slavic Muslims were 32.4 %, or 612, 137. Roman Catholic Croats were 22.8 %, or 434, 061. The total population of Bosnia in 1910 was 1,897, 962. In the newly formed Parliament, Serbs had 32 elected seats and 37 total seats, Slavic Muslims had 24 elected and 29 total seats, while Croats had 16 elected and 23 total seats. Nevertheless, the proportion of Serbian serfs far exceeded their total population. This "agrarian inferiority" or rural marginalization of the Serbian population led to unrest and dissension. The percentage of "servile tenures" or serfs in 1910 was as follows: 74.0 % were Serbs, 21.4 % were Croats, and 4.6 % were Muslims. Thus, the economic position of the Serbian population did not improve and indeed deteriorated. This economic exploitation and oppression of the Serbian population would lead to the formation of nationalist groups and revolutionary movements. Hercegovina was the most impoverished and the poorest region where Serbian farmers suffered the most. Gavrilo Princip would come from this area. The Austro-Hungarian government actively promoted and propagated the Bosnian nationality, Boshnjachka, or Boshnjaci, as an ideological underpinning to their anti-Serbian Bosnia policy. All three ethnic groups, Orthodox Serbs, Slavic Muslims, and Catholic Croats were classified under the Bosnian nationality, all three ethnic groups were Bosnians. The reasoning behind this policy to classify all three groups under one designation, Bosnian, was to prevent identification between the Serbian population of Bosnia-Hercegovina and Serbia proper and the Catholic Croatian population with Croatia and to act as a divisive force to preclude Slavic unity. The Austro-Hungarian anti-Serbian policy would be continued by Croatian nationalist Josef Frank, an Austrian Jew who would convert to Roman Catholicism. The Frankist Party or Frankovci would evolve into the Ustashi, led by Ante Pavelic, a Croat born in Hercegovina, who was a follower of Frank. Bosnia-Hercegovina thus continued to be ruled as an occupied province of a foreign empire. The Habsburg Emperor in Vienna ruled Bosnia much like the Turkish Sultans had ruled Bosnia for centuries from Constantinople. Ironically, both Austria-Hungary and Croatia were Roman Catholic, but the Habsburgs rejected Trialism, including Croats in the Empire as the third, Slavic component. Both Austria and Hungary opposed Slavic nationalism and Slavic self-determination. Croatian independence and sovereignty was opposed by Austria and Hungary. Moreover, Austria-Hungary opposed Pan-Slavic unity. The Bosnian Muslims were supported because they acted as a strong divisive force and as a bulwark against Slavic self-determination and nationalism in Bosnia. Austria-Hungary was unstable because of the large Slavic population of the Empire which sought self-determination and autonomy or independence. Austria-Hungary, thus, opposed Croatian nationalism and Pan-Slavic nationalism because they threatened to destabilize and splinter the Empire. On October 5, 1908, Austria-Hungary annexed Bosnia-Hercegovina unilaterally and unconditionally in violation of the 1878 Treaty of Berlin. The annexation created outrage in Russia and the other European nations. Bosnian Serbs and Serbs in Serbia and Montenegro reacted with outrage and a sense of betrayal. Bosnian Serbs began planning acts of civil disobedience and even political assassinations to protest the illegal act of the Habsburg Monarchy. The illegal annexation of Bosnia would lead directly to the assassination of the Archduke and the outbreak of World War I.
Austrian foreign minister Aloys, Count Lexa von Aehrenthal made the decision to annex Bosnia-Hercegovina to preclude the Ottoman Empire from regaining control and to prevent the self-determination of the Serbian population of Bosnia. In July, 1908, the Young Turk revolution sought to return Turkey to the rank of the Great Powers by establishing a constitutional government and initiating reforms throughout the moribund Empire. Under the Treaty of Berlin, the Turkish Sultan retained sovereignty over Bosnia. Aehrenthal perceived the changes in the Turkish government as a direct threat to the Austrian occupation of Bosnia. The 1875 Bosnian Revolution had been launched by the Serbian Orthodox population to free themselves not only from Ottoman economic exploitation and political repression, but also to advance Serbian nationalist goals, to achieve autonomy or self-determination, to be able to decide their own political and national future. Serbia and Montenegro and Russia had backed and supported the Bosnian Serbs in these objectives. By annexing Bosnia, a further goal was to preclude any changes in the borders of Bosnia or the internal political status quo. On September 16, 1908, Aehrenthal met with the Russian foreign minister, Aleksandr P. Izvolsky at Bachlau, in Moravia to discuss the proposed annexation of Bosnia. A deal was struck. Austria would support the opening of the Dardanelles and Bosporus straits, which were closed to Russia since 1841, if Russia would not oppose the annexation of Bosnia in the future. Russia needed the ports for commercial shipping and for strategic military and naval objectives. Izvolsky pledged that Russia would not object to the annexation. By a rescript of October 7, 1908, the two provinces of Bosnia and Hercegovina were annexed. The decision by Izvolsky created immediate outrage and strong popular opposition in Russia and in Serbia and Montenegro. The Bosnian Crisis of 1908 resulted, an early rehearsal for World War I. Serbia demanded that the Serbian population of Bosnia be allowed to secede and to decide their own political and national future. Due to domestic pressure and opposition to his policies, Izvolsky had to reverse his position and to support Serbia. Austriathreatened to invade Serbia if Serbia continued to press its demands. Germany backed Austria-Hungary. Russia was forced to back down being unprepared to wage a war against both Germany and Austria without support from the other Great Powers, such as ally France. War was thus averted this time. But the unconditional and unilateral decision to annex Bosnia created turmoil, anger, and outrage throughout Europe. Austria had violated the Treaty of Berlin, had violated international law and agreements by a provocative and reckless diplomatic gambit. In March, 1909, Izvolsky renounced all opposition to the annexation. Then Serbia renounced its demands. Russia had been humiliated and deceived. The tensions with Serbia were not resolved and in fact were greatly exacerbated. The Bosnian Crisis of 1908 set the stage for World War I. The next crisis would lead to war. The First Balkan War of 1912 heightened tensions between Serbia and Austria-Hungary. Serbian forces defeated and expelled the Turkish forces from Novi Pazar, Macedonia, and Kosovo. During the second Balkan War of 1913 Bulgaria was attacked. Austria maintained a containment policy against Serbia. Albania and Bulgaria were allies of Austria-Hungary. In May, 1913, General Oskar Potiorek, the governor of Bosnia, declared a state of emergency, dissolved the parliament, and shut down Serbian cultural associations and suspended the civil courts. These repressive measures only increased the resistance to the Austrian occupation. Nevertheless, the Austrian occupation of Austria was threatened by the Balkan wars. The commander of the Austrian Army, Franz Conrad von Hotzendorff, had called for a pre-emptive war against Serbia during the first decade of the century. Serbia would be obliterated and wiped off the face of the map, the spoils given to Austrian allies Albania, Bulgaria, and Hungary. Austria also launched a propaganda war against Serbia, which relied on the theme of Serbian atrocities and massacres against the Albanian population. This propaganda war against Serbia would be a precursor and model to the US State Department propaganda war against Serbia in the 1990s. In 1913, Leo Freundlich, an Austrian Jewish writer and parliamentarian, a member of the Social Democratic Party, published Albanias Golgotha: Indictment of the Exterminators of the Albanian People, an inflammatory propaganda diatribe against Serbia in which the following sections appeared: The Albanians must be exterminated!, A war of extermination, Manhunts, The Serbian thirst for blood, The marauding Serbs!, Wholesale murder. Roy Gutmans 1993 Eyewitness to Genocide and John Burns' "ethnic cleansing" articles in the New York Times pale by comparison in its anti-Serbian bigotry and racism. Freundlich published nothing in 1914 when the Austro-Hungarian Army invaded Serbia and massacred Serbian civilians and committed atrocities against the Serbian Orthodox population with the slogan, Serbia must die! (Serbien muss sterbien!). R.A. Reiss published a Report upon the atrocities committed by the Austro-Hungarian army during the first invasion of Serbia wherein he appended depositions of Austro-Hungarian POWS who described their instructions. In the 28th Landwehr Regiment, a sergeant deposed that: The officers told us to shoot all that was Serbian[T]he officers urged them to kill everything. A reservist of the 70th Regiment reported: Captain Lahodny gave them the order to kill without mercy all that was Serbian, both in Serbia and in Bosnia, and also to burn the villages. Another soldier reported that the first Bosnian regiment killed peasants in Stavain (Bosnia) and burnt all the housesIt was the Lieutenant-Colonel of the Regiment who ordered this massacre. In Uvatz Lieutenant-Colonel Krumenack gave the order to set every house on fire, and that merely in order to destroy the house of a Serbian priest. In Strbzi and Dobrava everything was likewise burnt by order of the same commander. All these villages are in Bosnia. As a general rule all houses on the Drina (Austrian side) owned by Serbs were fired. A soldier in the 78th regiment of the 15th Company reported that Lieutenant Bernhard told them that they must kill every living creature while another reported that they must show the Serbs what Austrians can do. They were to spare nothing and to kill everything. Reiss concluded that it is beyond all doubt that the massacres of the civil population and the pillage were systematically organized by the command of the army of invasion. Reiss described the Bosnian Muslims as fanatical Bosnian Mohammedan peasants, those professional plunderers. This was a systematic and planned Austrian policy. One consequence of the Austrian occupation of Bosnia was that Sarajevo and other Bosnian cities were flooded with over 9,500 bureaucrats and administrators and commercial and trade interests. Many of these were Ashkenazi Jews. Austrian Jews sought to benefit from the annexation and occupation of Bosnia. Racism and bigotry are based in self-interest. The racist attack against Orthodox Serbs by the Jew Freundlich can be explained in this way. His moral outrage is selective and self-interested. Austrian Jews would gain economic advantages by the Austrian occupation of Bosnia. Remarkaby, Roy Gutman, Anthony Lewis, Susan Sontag, James Rubin, and other prominent Jews would apply the same techniques against the Serbian Orthodox population, i.e, professing a disingenuous concern for the human rights of the Albanians and Bosnian Muslims, at the same time ignoring the genocide and repression of the Palestinian population by the zealous Zionist nationalist government in Israel and the Occupied Palestinian Territories, which were being illegaly settled by Jewish settlers. There was little concern for the human rights of the Palestinians, Kurds, or Basques. There is a dictum: Follow the money trail. Self-interest goes a long way in explaining the bias. Thus, under Austrian occupation, there were thousands of occupation administrators and bureaucrats, many of whom were Jewish. During the Ottoman Empire, by contrast, there were at most only several hundred administrators. On June 28, 1914, Serbian Vidov Dan, or Kosovo Day, Gavrilo Princip (1894-1918), a Serbian student from Hercegovina, assassinated the Archduke Franz Ferdinand, the heir to the Habsburg throne, and his wife Sophie in Sarajevo. Princip and the other Bosnian Serb conspirators in the assassination were members of the Young Bosnia (Mlade Bosne) Movement, which included Bosnian Muslims, and which sought to gain freedom and independence for Bosnia from foreign rule and occupation by Austria-Hungary. The day chosen for the visit to Bosnia, June 28, is Serbian Vidov Dan, the day commemorating the Serbian defeat at the Battle of Kosovo to the Ottoman Turks, which defeat would result in over 400 years of Turkish Muslim occupation and subjugation. That this date was chosen for the visit by the Archduke either represented a gross provocation to the Bosnian Serbs or was merely an inauspicious coincidence. Oskar Potiorek, the Austrian Governor of Bosnia, who had organized the visit, was virulently anti-Serbian. Heir to Austrias Throne is Slain with his Wife by a Bosnian Youth to Avenge Seizure of his Country Heir was warned not to go to Bosnia where Populace met him with Servian [Serbian] Flags. Fearing that the Austro-Hungarian occupation and annexation of Bosnia was threatened by this act of defiance, the Austrian government declared war on Serbia, following an ultimatum to Serbia which the Austrian regime knew would be unacceptable. While the assassination was planned, organized, and carried out by its own subjects, Bosnians, nevertheless, the Austro-Hungarian government declared war against Serbia, which the Habsburgs perceived as a threat to their national interest in maintaining their occupation of Bosnia and to their political stability by fostering Slavic unity and Slavic self-determination. World War I was in the making for over a decade. The assassination in Sarajevo provided the spark and the pretext. Austria-Hungary had planned to preemptively invade Serbia and to dismember it, giving territory to clients and allies Bulgaria and Albania. The Pig War was an early attempt at economic strangulation of Serbia. Austro-Hungarian imperial-colonial expansionism was leading towards war. In 1914, sanctioned by the Vatican and Germany, Austria-Hungary began World War I. Following the defeat of Austria-Hungary in 1918, the Latin Bridge in Sarajevo where the assassination occurred was renamed the Principov Most (Princips Bridge) to honor Gavrilo Princip. Near the bridge, the Muzej Mlade Bosne (Museum of the Young Bosnia Movement) was established, in honor of the Bosnian nationalist group which had planned and organized and carried out the assassination. Gavrilo Princip died in 1918 while under Austro-Hungarian imprisonment.